mother's day is approaching. have you thought about what you want to give to your mom? 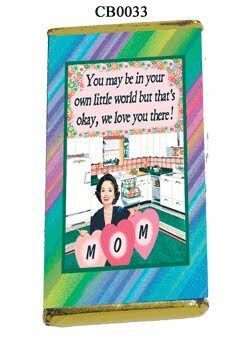 last year, i bought my mom chocolate bars from olivesandwiches.com. they are super cute and come with some pretty amusing wrappers. the bad thing about buying them last year was that you couldn't buy less than a dozen, i think it was. they also used to have some great unique flavors, but it appears that now, they only come in milk or dark chocolate. the good news is that you can buy one at a time. they also have cards and bath salts. it's definitely worth checking out. also, personalwines.com sells wine with personalized labels at a reasonable price. pick your wine and design your label and order. i bought champagne from here last year for my sister-in-law's wedding. it looked great and they do have mother's day labels. 2 years ago (i think), i designed a fabulous apron with a huge picture of my smiling face for my mom. the caption read "i wish i could cook as well as my daughter". i made this and several other items, including tote bags and coffee mugs at zazzle.com. you can even make custom postage stamps. the last suggestion i will give you is personalcreations.com. they have allot of great personalized gifts from casserole dishes and throws to picture frames. there are a few suggestions for mothers day. it's a little over a week away, so i'm sure if you order now, you can have your gift here on time. these are all sites that i buy from on a regular basis. i have never had a problem with an order from any of them.